This Sheer Dot Ribbon with a Coordinating Wire Edge is ideal for your bows for gift baskets & boxes, craft projects & more! 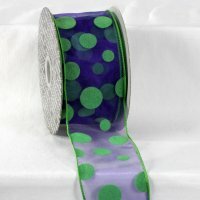 The Ribbon Diva carries a variety Sheer Polka Ribbon for all Season & Events. Browse our huge selection and we’re sure you won't be disappointed!